Greyson was born during a heatwave, so this summer baby spent much of his first months in just a diaper. When we went to Greyson's first pediatrician's appointment, I was fanning him furiously, concerned he could have a heat stroke, as we walked four blocks to the office. 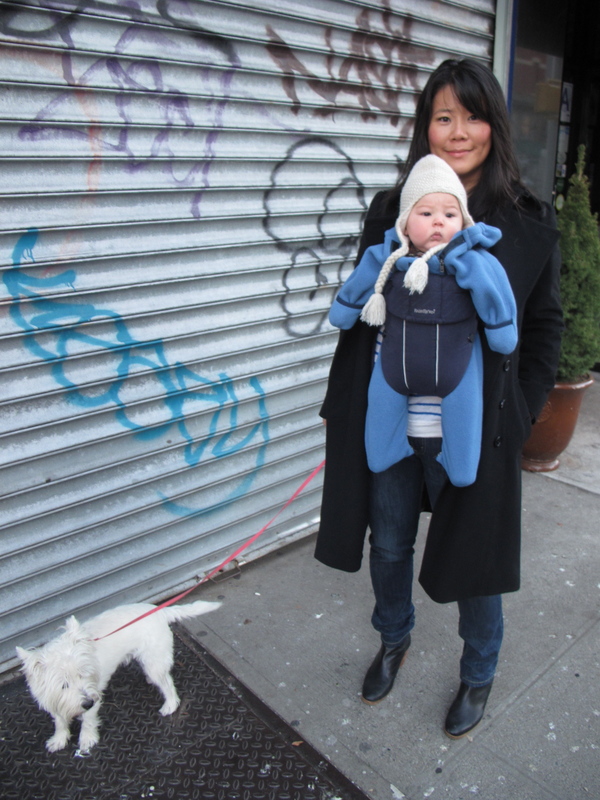 But around September, we started thinking about how we were going to prepare Greyson for his first New York City winter. It was a conversation I had many times with the moms in my mom group. We were all perplexed. Do you put the babies in a thousand layers? Do you put them in a parka...but then how do they fit in the carrier? And my big things was, why is it so hard to find things made of wool instead of cotton, which is not a warm fabric? Here are our outdoor and indoor essentials for winterizing your baby! In terms of sizing, Greyson has been wearing the 6-months size since three months ago. He's 5-months old now and he weighs about 18+ pounds or 8 kilograms. He'll definitely fit into this size for the rest of this winter and going into spring. Oh, my mom also got us this down, hooded Ralph Lauren snowsuit in the 9 months size. With mittens, it will replace the Patagonia bunting when it gets really cold out. 2. When it's extra cold and thick socks aren't enough, we like shearling booties. I got this brand but plain, unpainted booties, at the discount store Daffy's for $20. Greyson is wearing them in the below picture. They stay on well when they're tucked into the pants like this. 3. The JJ Cole BundleMe is what everyone in New York seems to use, so I didn't bother doing any research. I figured the hundreds of NYC parents I've seen using this thing must know something about bundling up their babies. I've also heard about L.L. Bean's bunting and the 7 am Enfant bunting. JJ Cole makes their BundleMe in infant and toddler sizes, but unless you want a bundleme that fits a carseat perfectly, I'd just go for the toddler size, so you don't have to buy another one next winter. Our baby will just grow into the toddler size seen below. This stroller bunting is a great added layer of protection against the elements, but doesn't replace a coat or thick layer when it's actually cold out. In the fall, sure, but not winter. 4. 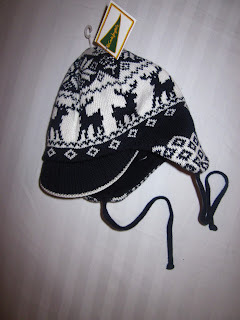 Winter hats that tie! I think wool is the warmest, but don't even get me started on how hard it is to find wool clothing and accessories, even in New York. Anyway, get the warmest thing you can find (try not to get cotton). Hats are useful even when you have hooded buntings because sometimes you'll want an extra layer underneath the hood, where wind can get in. Here are the hats we got in Barcelona. 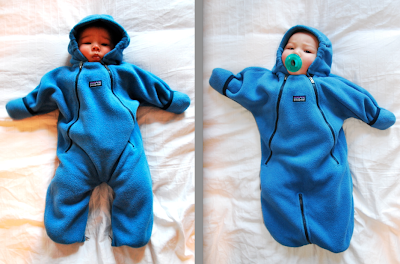 The first one is from Zara Baby and it's made of acrylic and the other is fleece-lined cotton. I would normally not get a cotton hat even if it's lined in fleece, but my husband and I thought this hat was too darn cute to pass up. 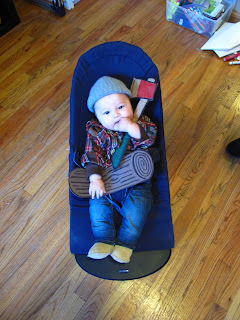 I recommend hats that tie because things love to slip off babies. I can't tell you how much time I spend pulling socks up and shirts down. I don't want to add hats to the mix. Exhibit A below. 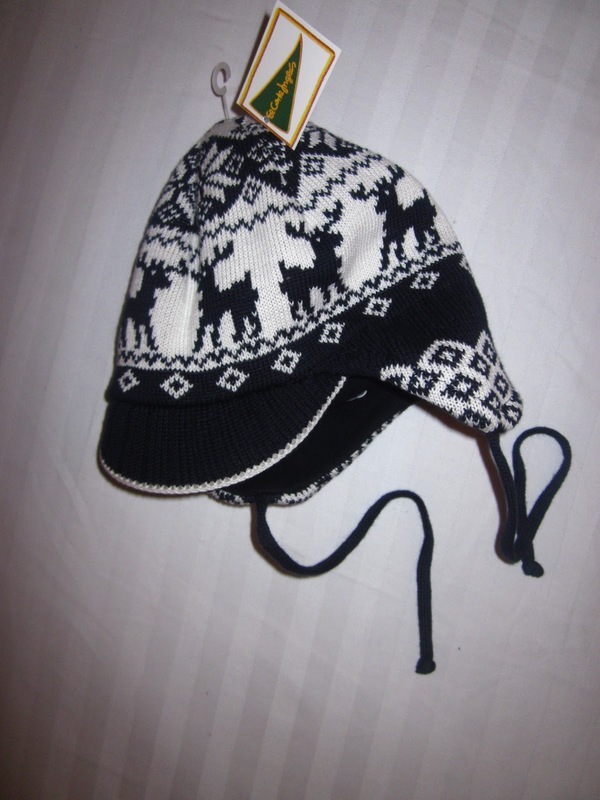 We saw this cashmere hat at Ralph Lauren last spring, before Greyson was even born. We were like, aww, how cute! 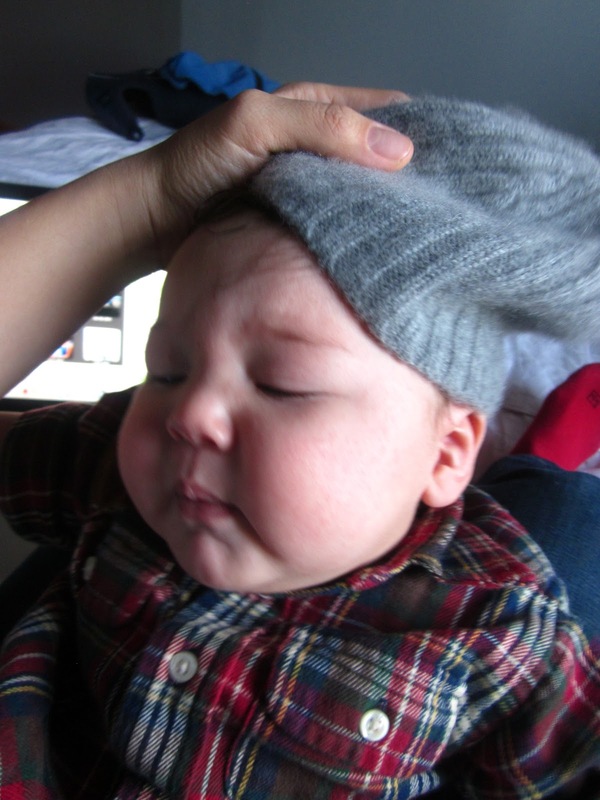 Yeah, it's crazy cute...and it doesn't stay on his head! 5. Get some tights (yes, even for boys)! Socks do not stay on our baby's feet. They either slip off on their own or the baby starts tugging at the sock, trying to get it in his mouth. So, we got some tights from L.L. Bean, which add an extra layer on the legs and don't come off. I wish they were made of soft merino wool (argh again...why is it so hard to find wool?? ), but atleast they are made of thick cotton. 6. For the coldest winter days, get a snowsuit and use the rain cover on the stroller. My mom just got this one for us in navy from Ralph Lauren. 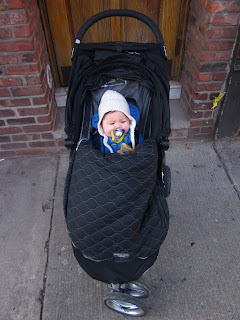 When it gets really cold, the fleece bunting won't cut it, so we'll put him in this snowsuit and cover the stroller with the rain cover to keep out the wind. 7. Greyson sleeps in a fleece Halo Sleep Sack over his PJs every night. Babies move too much to cover with a blanket overnight (plus, they say not to put anything in the crib with them for the first year). He wears the size Medium, which gives him plenty of room to grow. The large, which we saw in the store, was way too big. 8. Wool socks. This is something I want, not have. Yes, I'm on a rampage about wool again. The only wool socks that weren't made by some random grandma in Vermont and don't look like they'd fall right off my baby's feet are the SmartWool baby socks. Why they come only in random patterns and color combos instead of just solid colors, I don't know. 9. Wool blanket. Again, this is something I want, but don't have. This blanket is something that I'll probably get for Greyson next winter. 10. Layering pieces since New York City apartments have really variable heat. 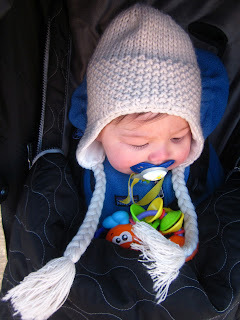 I like dressing Greyson in layers, so I can adjust his clothing to the temperature. He has several (cotton...uch) sweaters and one wool (yay) sweater. But sometimes it's good to have a thin layer, too. For that, I like American Apparel's cotton cardigans. Around the house, these are great because you don't have to take them off over the head. 11. Aquaphor for dry skin. I slather this stuff all over Greyson (face and body) after his bath. 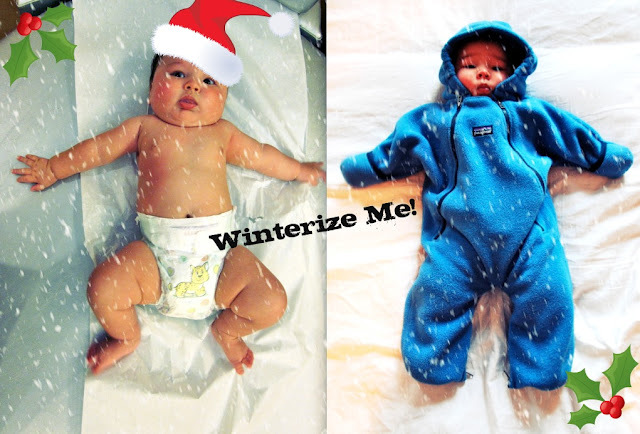 My skin used to suffer in the winter, so I imagine that Greyson's new baby skin is ultra sensitive to the cold, wind and dry air. I hope this list was helpful to some of you. If you have any tips you'd like to share, I'd love to see them in the comments. Merry Christmas and happy winterizing! 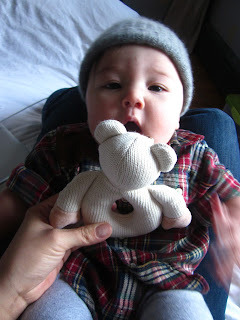 Love the idea of Smartwool baby booties! Also love this post. So useful! Christie, it's sort of like our conversations about winterizing put into a blog post. I think we've talked about getting Greyson and June ready for winter like a million times! That's great! So cute. good luck for you.